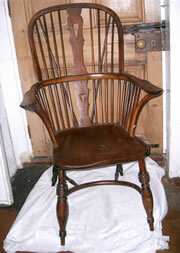 Windsor chairs are amongst the more popular and easily recognisable styles of English provincial antique chairs. Made predominantly between 1800 and 1840 in England, some occasional examples can be found dating through to the late 1800s. 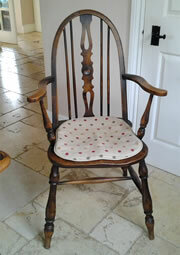 Windsor Chair backs are usually 'sticks', sometimes with a decorative splat. The two main forms of Windsor chairs are high back and low back, high back Windsor chairs usually command a higher price. The oldest examples were made with Yew and Elm, slightly later with Ash. 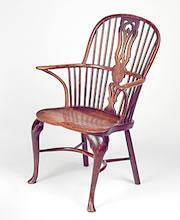 Yew wood Windsor chairs tend to carry the greater value. Seats are of solid wood, with legs and arm supports dowelled into the structural seat.